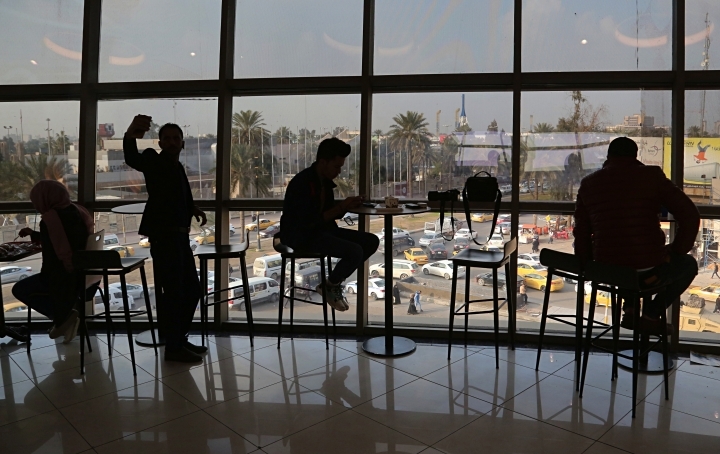 BAGHDAD — Baghdad's main commercial district has seen more bombings than its residents can count. Death visited almost daily during times of war — most horrifically, a 2015 suicide bombing that ripped through two shopping malls, killing over 300 people. 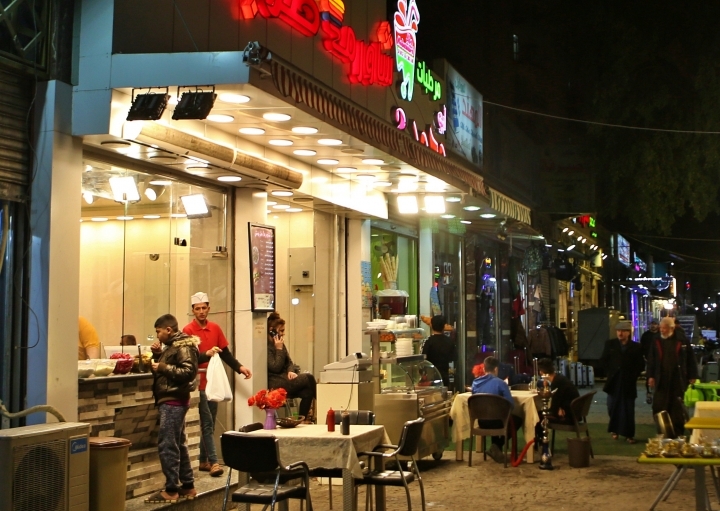 But over the past year or so, the residents of Karrada have felt more normal than they have in decades. Streets lined with food stalls are crowded with shoppers, coffee shops and restaurants are packed until late, and the grey cement blast walls that protected against bombings are being removed. "I used to go to school and come back home, nothing more," said Rusul Mohsen, a 33-year-old middle school teacher, seated recently at a store front sipping coffee. "If I went to a restaurant, I would ask to sit in a corner the farthest away from any windows, fearing a car bomb explosion might shatter the glass." For the first time in 15 years there is no major war or insurgency in Iraq, and the defeat of the Islamic State group in late 2017 after a ruinous four-year war has given the population a moment of respite. Despite the enormous challenges ahead, there is a guarded sense of hope across the capital. Car bomb explosions that became the norm after the U.S.-led invasion in 2003, making the Iraqi capital's name synonymous with war, have ceased — at least for now. Thousands of concrete barriers that snaked through the city as protection from suicide car bombers have been towed away in trucks, easing traffic. Army spokesman Brig. 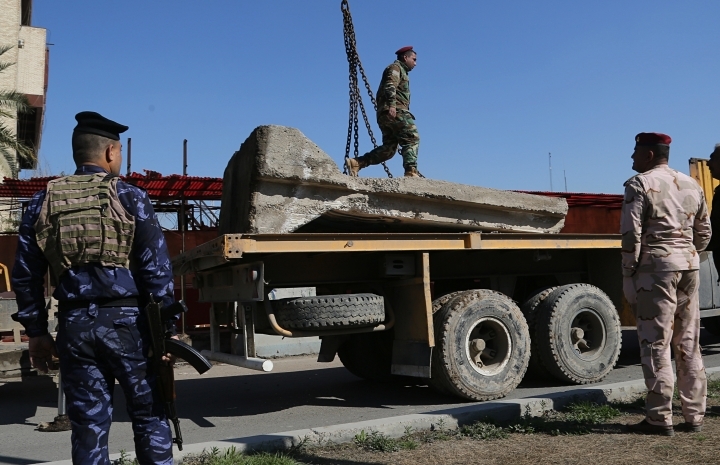 Gen. Yahya Rasool said thousands of barriers have been towed away to a plot of land on the outskirts of the city, saying they may be used in the future around Baghdad to protect against infiltration. Parts of the heavily fortified Green Zone on the west bank of the Tigris River have reopened to the public, including public access to the landmark "Victory Arch" — a 40-meter (131-feet) tall arch of two swords held by bronze casts of former dictator Saddam Hussein's hands to commemorate the Iran-Iraq war. On Monday, Prime Minister Adel Abdul Mahdi eased restrictions on the Green Zone further, announcing the highly secure area would stay open to the public for an hour and a half longer in the day. The U.S. established the Green Zone in 2003 to secure its embassy and Iraqi government institutions. But the zone became a symbol of the country's inequality, fueling the perception among Iraqis that their government is out of touch. On the other side of the river, Baghdad's famous Rasheed Street, the capital's oldest street and cultural center known for its crumbling, old Iraqi houses, has also reopened for cars and pedestrians after a 15-year closure due to security risks. A new Central Bank headquarters, a towering waterfront building on the banks of the Tigris designed by the late Iraq-born architect Zaha Hadid, is currently under construction, expected to be completed next year. 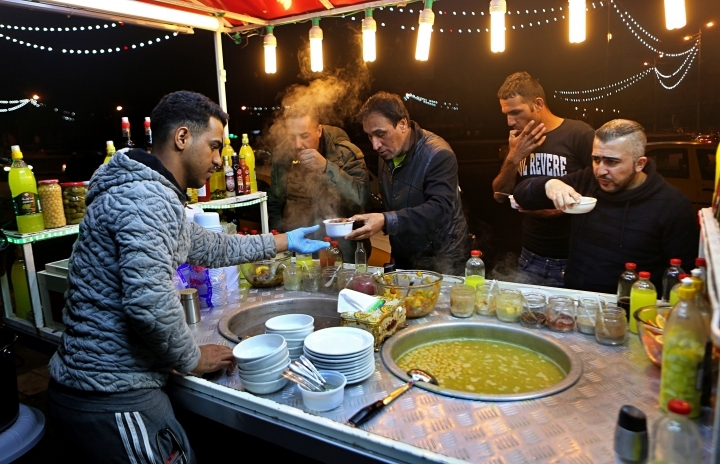 "Baghdad feels better than it has since 2003," remarked a veteran Western diplomat in Baghdad. Even so, the country faces massive challenges. The Islamic State group, which is about to lose its last shred of territory in neighboring Syria, is creeping back in Iraq, stepping up insurgent-style attacks in areas outside Baghdad and the country's north. Tens of thousands of people remain displaced and much of the country is in ruins. The country is plagued by corruption, and in the oil-rich but parched south, violent riots have repeatedly broken out against living conditions. Baghdad, an ancient metropolis of 8 million people that was once the Arab world's cultural center, is barely functional, its infrastructure crumbling. Armed militias who fought IS alongside the Iraqi armed forces roam the streets in what many see as the country's latest menace, amid reports of kidnappings for ransom and general lawlessness. Unemployment, poverty and disenfranchised youth are widespread. "There is a big gap between people's aspirations and the government ability to deliver," the Western diplomat said, speaking on condition of anonymity so he could speak freely. Still, many hope that after years of bloodshed, Iraq is starting to turn a corner. In Karrada, the Hadi Center where a 2015 suicide bombing trapped people in a burning inferno for hours, killing around 300 people, is full of shoppers and youngsters fill the food court. The adjacent Laith Center had to be razed and rebuilt from scratch. It's now almost completed. Assem Gharib, owner of a pastries and ice cream shop, said for years he used to pay someone to supervise the street outside his shop and keep cars from parking in front. "I used to be frightened whenever a car approached, imagining it to be a suicide bomber or a car bomb. Now it's the opposite, we are happy when a car parks in front of the shop," he said. That kind of confidence eluded most Iraqis for the past 15 years. The country has been at war, one way or another, for more than a generation, starting with the eight-year Iraq-Iran war that ended in 1988, followed by Iraq's invasion of Kuwait in 1990 and the subsequent military intervention by the United States. The worst bloodletting came with the U.S.-led invasion of Iraq in 2003, which triggered an al-Qaida driven insurgency and sectarian violence that washed over the country, killing tens of thousands of Iraqis. Bombings reached up to 10 a day. The violence culminated with the Islamic State group, an al-Qaida offshoot, seizing Iraqi cities and declaring a self-styled Islamic caliphate over large parts of Iraq and Syria. That triggered a displacement crisis unprecedented in Iraq's history. Millions fled their homes in the face of the militants' rapid advance. Others fled as Iraqi forces, backed by the U.S. and Iran, battled back, ultimately reclaiming the last town in late 2017. Few dare to hope the current lull in fighting will last and many worry fear the growing power of the Shiite militias, known collectively as the Popular Mobilization Forces. Bashar Ali, a 33-year-old shop owner on Karrada street, said he fears the return of IS fighters from Syria and the lawlessness outside the city, including kidnappings and killings. 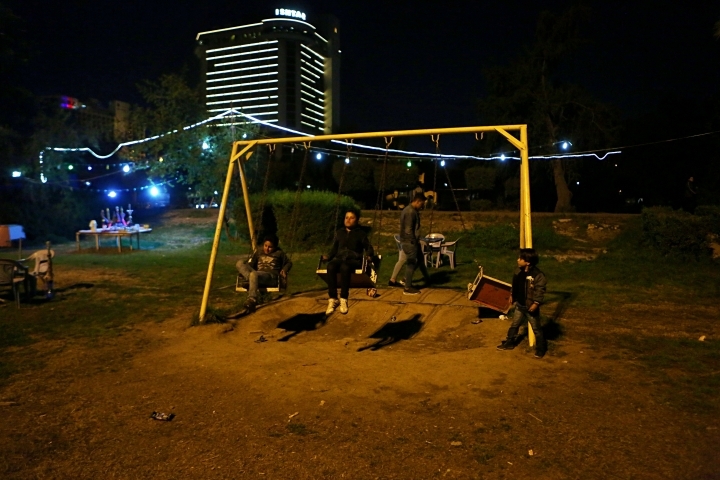 "Baghdad is like my home, I feel safe in my own home, but when I go outside I don't feel this way," he said.